Why online store must use this awesome tool? Sometimes, customers would like to refund your products for some reasons. Allowing customers to refund will satisfy them more yet threaten your sales significantly since any customer is able to refund. In this case, online stores need a solution that benefits both parties. Store credit has been built to solve this problem. Initially, a store credit is a document offered by a store to a customer who returns an item which is not eligible for a refund. Hence, it can be used to buy other goods at the store. Customers may exchange merchandises or receive store credit in the amount of the item’s last sale price. These days, along with the development of the e-commerce industry, store credit becomes an excellent tool which plays multiple tasks and functions for online stores. It is unavoidable that while selling products to customers, many mistakes may occur, even more to online stores than physical stores. Beside refund request, your customers may receive the wrong items or late delivery. For compensation, in these cases, stores can give shoppers a suitable sum of credit to take away bad experiences and brings back customers’ satisfaction. Sometimes, online stores encounter with losses from expired products or out-of-date ones. To prevent this, store credit is a wise choice to encourage customers to buy these items. Also, in certain promotion occasions such as Black Friday, Christmas, New Year or Birthday, customers can be rewarded a credit amount to their credit balance. The credit will work as the powerful motivation to encourage shoppers to take advantage of the gift and make purchases quickly. Among various loyalty programs, using credit to reward your lifetime customers after configured period seem to be most effective. Customers can use the credit reward to continuously spend on your sites, and at the same time, you can retain them to generate more sales. 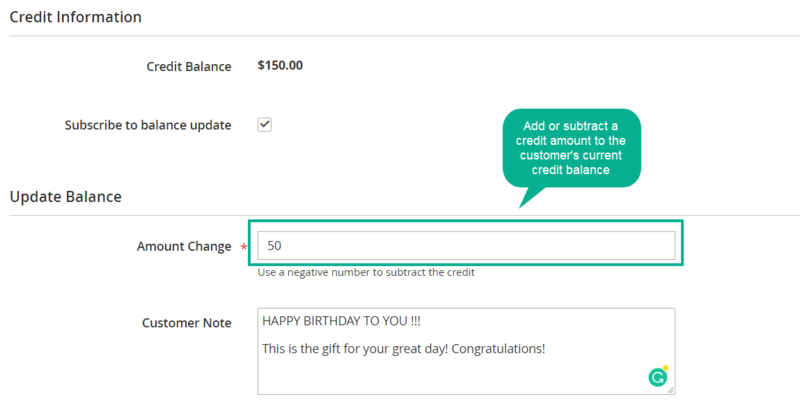 Store Credit extension for Magento 2 allows admin to edit customers’ credit balance. They can do it by going to admin panel to create new transactions or edit the current ones. Admins can select customers from the available list then insert the specific amount of credit change that depends on the customer behaviour and admin wish. Also, the module enables leaving notes from both customer and store admin in certain transactions. The module also creates a special product called “Store Credit Product”, which allow customers to buy other stuff on your sites with lower prices. It can do that because it allows admin to set the discount for price of store credit product. By that, customers actually use their credit to buy items with attractive prices. Also, each product can be assigned with specific credit policy depending on the store owner’ purpose in each sales campaign such as the wish to improve sales for particular products. Another helpful tool that this module brings about is that it allows sending email to customers in which notify them of updated balance. Anytime there is a change in credit account of users, they will immediately receive this email. Therefore, customers can always be updated about their credit budget and active in their credit spending during shopping. This also shows the profession and excellent customer care from the shopping store. 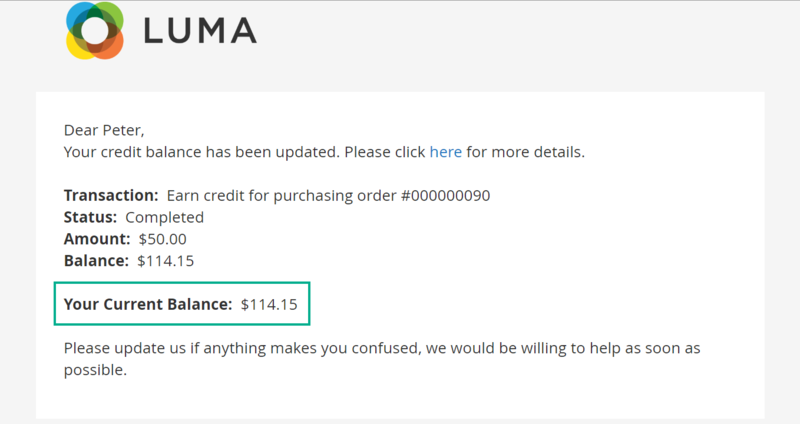 Select Admin Order/Checkout page where the credit is spent.